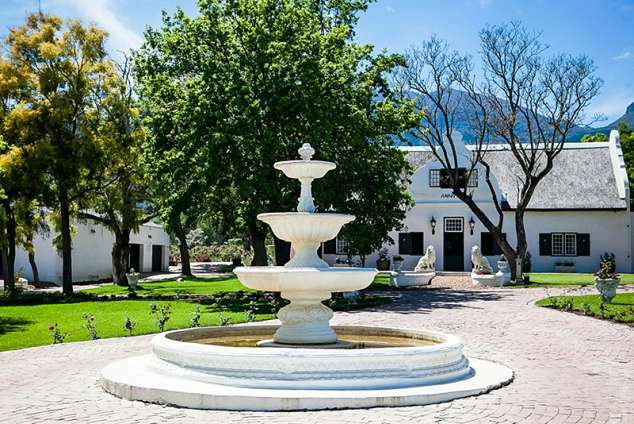 De Kleijne Bos Country House - Paarl Accommodation. The four star De Kleijne Bos Country House which nestles in the heart of the Drakenstein valley, features the well known Winelands region. Situated on the outskirts of the Paarl Village, only 3km from the main town, it is an ideal base to indulge tastes for fine wines and world class cuisine. The original De Kleijne Bos Country House offers 8 well equipped rooms including, 7 luxury rooms and 1 standard room, which are all designed with comfort in mind offering charming accommodation and expected services for guests to relax and unwind. All en-suite rooms are individually appointed and have comfortable lush duvets with percale cotton linen. Nearby attractions includes the Boschenmeer Golf Course, Paarl Wine Estates and the Jonkershoek Nature Reserve. Detail description : De Kleine Bos breathes South African history. It is the farm where the GRA (Genootschap vir Regte Afrikaners), the body that took up the cudgels for Afrikaans to be recognized as an independent indigenous language separate from Nederlands (Dutch), was formed on 14 August 1875. It is also next to the venue where the first Afrikaans School in South Africa was erected the following year, in 1876. 2839 page views since 20 Jan, 2016. Last updated on 05 Mar, 2019.